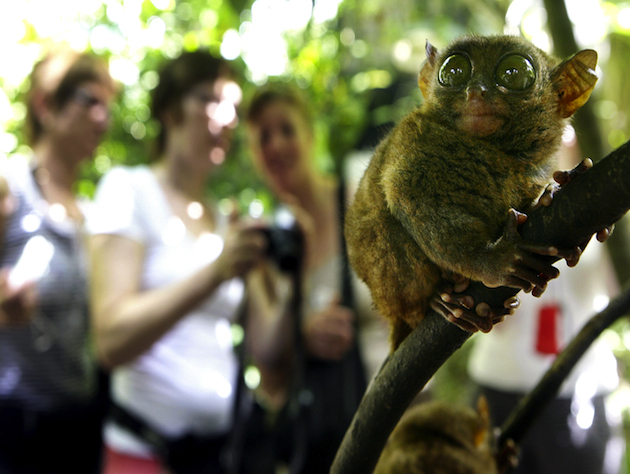 The tarsier, a small primate best known for its bulging eyes and quiet demeanor, has a secret: It's actually incredibly loud, particularly if you're a dolphin. "It turns out that it's not silent. It's actually screaming and we had no idea," Humboldt State University evolutionary biologist Marissa Ramsier tells Live Science. But why would a primate capable of making audible sounds at a lower frequency employ high-frequency cries? The most plausible explanation is that the pint-sized primates, about the size of an adult human's clenched fist, are most likely using the "silent" screams to coordinate with other tarsiers to avoid predators and find food. Some companies even sell ultrasonic emitters to "startle" cats away from unwelcome areas. Between their limited population numbers, nocturnal hours and skittish behavior, it's understandable that scientists took so long to make this discovery. Texas A&M anthropologist Sharon Gursky-Doyen stumbled across the find when she noticed that when the tarsiers opened their mouths to speak, she wasn't hearing anything. "She had the foresight to get hold of a bat detector, and she was able to get that vocalization on a recording," Ramsier said. You can listen to a slowed-down version of the tarsier cry here. Though be warned, it's not exactly the most pleasant sound in the world. After that, researchers carefully gathered six tarsiers and used noninvasive methods to test the ultrasonic sound theory. The tests reportedly only took about an hour before the primates were released back into their natural habitat. The results of the study were first published this week in the journal Biology Letters. "There could be a whole world of signals out there just waiting for us to hear them," Ramsier said. "We just have to listen."